September | 2012 | What's New at Rainnea Ltd. 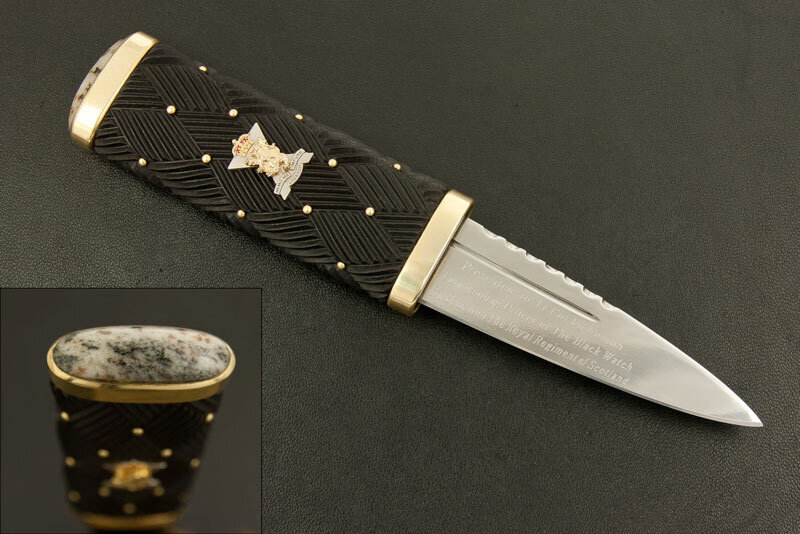 This Sgian Dubh was commissioned for a presentation to the Commanding Officer of The Black Watch, 3rd Battalion The Royal Regiment of Scotland. It has an RSS badge inlaid into an African Blackwood handle carved in the regimental style with added brass pins and ferrules. The top ferrule holds a beautiful pommel stone cut by Nat Forno from a pebble found by Black Watch soldiers on the beach at their regimental headquarters at Fort George.